The slogan of the 2011 Daytona 200 should have been, “Well, that’s racing.” The historic race was plagued by multiple crashes and pandemic tire failure, but the day ended with a happy Jason DiSalvo—and the ecstatic Ducati factory—victorious, and the racing was as exciting as it’s ever been. 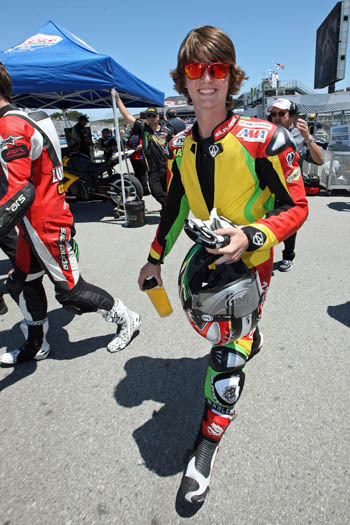 The practices and tire tests were done in shorter sessions and cooler temperatures than the main event, so the tire problems weren’t apparent to Dunlop (provider of the spec tire for the event) until racers started to pit early to change front tires, soon followed a few laps later by more and more riders. At that point, Dunlop asked the AMA to stop the race so the tires—a new compound formulated for the race—could be swapped for another compound. Understandable when the temperature soared to over 100 degrees, and the pavement had recently been resurfaced for the first time in years. During that interlude, which lasted more than an hour, DiSalvo’s Team Latus Motors Racing swapped out his 848 EVO’s motor, which DiSalvo thought may have lost a cylinder right before the red flag was thrown. On the restart, it was close racing, with the fastest six or seven riders dicing closely until DiSalvo—who had backed off with five laps to go when he thought he was once again having bike problems—“slingshotted” himself into the lead position shortly before the finish. 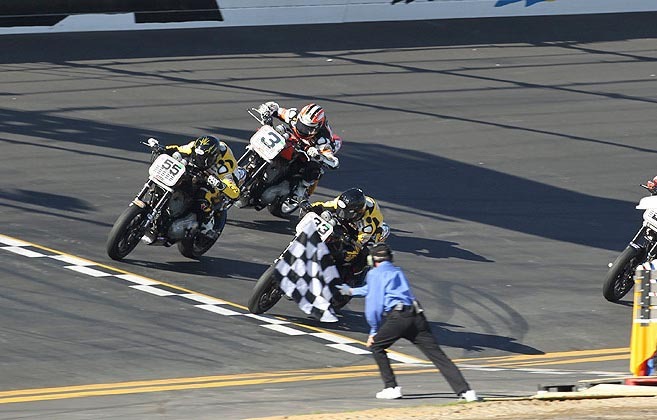 The race was cut short, but it was no less exciting or memorable, and the impression is that it was close, hard racing—classic Daytona 200. Ducati was justifiably proud of the win, but with seven 848s on the grid (the most Ducs in 10 years), and considering the displacement advantage, it’s hardly surprising. The XR1200 spec race was interesting as well, with the return of “Mr. Daytona” Scott Russell to the event. He wasn’t able to pull off yet another win, ironically finishing behind H-D communications man Paul James. But the racing was close, with the top three finishers (Kyle Wyman, Chris Fillmore and Joe Kopp) crossing the line .105 seconds apart, with Steve Rapp just .10 seconds behind them. Another story—an all-American one—is of the Sadowski brothers, Matt and Dave, jr., sons of 1990 200 winner Dave Sadowski. When not racing motorcycles, they can be found working the parts counter at Top Shelf Motorcycles, a Marin County, California service-and-accessories shop. Two Sundays ago, Top Shelf co-principal Tom “Turbo” Griffith showed up on my local motorcycle ride on a brand new Ducati 848 EVO. He couldn’t stick around for breakfast, though—he had to break in the bike and get it back to the shop to be race prepped. A week later, a pair of EVOs, now equipped with Racetech suspension, Leo Vince exhaust, race bodywork and a few other items, were loaded into a trailer. Fifty-one hours after that, the Sadowski boys pulled into the Daytona pits. Practice went well, with all the racers getting used to new tires. The 200 started well enough, with Mat and Dave jr. riding hard as they could and taking advantage of what seemed like most of the Sadowski family working as a well-timed pit crew, managing a 13-second pitstop at one point. But as the race wore on, the tire problems started rearing up, and the race was red-flagged for new tires. On the re-start, Dave jr., realized he would be racing what was essentially a 15-lap heat race, one he would be hard-pressed to win with what was essentially a stock-motored bike. Still, the four-time Daytona veteran pressed on to an impressive 19th place (as of Sunday night—continuing protests and other controversy may change the results). The winner of the Daytona “200” scored that result using TWO DIFFERENT ENGINES! Will this be the motorsports equivilent of the Barry Bonds* asterisk for Ducati in the record books? I’ve been a racing fan all my life… I don’t recall ANY motor race where engine replacement is even an option. Transmissions, bodywork, drivers, anything else attached, but ENGINES?! So if Formula One deep pockets develop a way to swap motors in a ten-second pit stop, that should be allowed? To heII with rev limits or missed shifts, just flog that thang, we’ll swap it if it blows! A great race…come on. It used to be. Daytona , in recent years, has had some of the worst officiating. Pace cars pulling in front of riders going 160MPH, having the pace car with only one man in it, etc. The AMA and DMG are doing a horrible job. If Mid-Ohio last year is any indication, road racing is dead in the U.S. The names of the classes are stupid too. What is a Daytona Sportbike anyway? Congrats to Disalvo but can’t believe he was allowed to change engines in the middle of a race. Can you remember when top rides and machines came to Daytona and raced? What a pathetic shambes it has become over the years. To the current riders, good luck guys the racing season starts soon. AMA and DMG need to stop running D.O.T. tires on that track, period! Use race only slicks that can handle the loads of that track. Can’t the AMA waive the D.O.T. rule for this one race only? If the AMA wasn’t so interested in dumming down the class, then this would never be an issue. How do they expect to build interest within the public and television audiences when average joe is at home watching this, and then it cuts over to nascar truck qualifying with no word on when or if the last portion of the 200 (joke) will ever be seen on tv? Yes, what portions of the race were available to watch were exciting, but the lack of organization, bad tire choice for this track, have combined to produce a PR looser! AMA, get it together, and do it NOW! again, it’s only AMA in name. all the racing interests (not just RR) are now owned by DMG a completely different entity. fwiw, they’ve been running DOT’s at DIS for years with no problems. however, this year we are fortunate enough to enjoy the benefits of a complete repave. i appreciate daytona’s willingness to pony up for such an expensive project in the middle of a recession. couldn’t have been cheap in 21st century dollars (even for nascar revenues). more telling is the last repave was in 1978…!!! doesn’t take a rocket scientist to figure out that 99% of dunlop’s data then was based on the old surface (as would theoretically be 99% of their tire inventory). btw, they did give word that the race was going to be revisted at 11 (ie. the spot reserved for the SBK races). it’s how i knew to tune back in. they didn’t give it immediately because it was live TV. at that moment, i don’t even think they knew if or when the race was going to be re-run until it was “in the can” so to speak…? aferall, how could they possibly know…? they’re video producers, not magicians. Norm, thanks for the clarifications. I still think at Daytona that a “pure” racing slick tire would be a much better option. Anytime you run D.O.T. tires with tread, you suffer from tread squirm. This results in less stability and more heat coming into the tire. Seems like this is a ‘no brainer’ to me. I don’t know what all the complaining is about. I watched and enjoyed the show. The only real bummer is Danny Eslick getting screwed. I mean really, if it was a tire problem that caused him to crash, and they stopped the race because of tire problems, should they have put him on the lead lap? It isn’t like they don’t make the rules up as they go anyway. I don’t think he would have won though. AMA has been trying to woo Ducati for years (like WSBK), now they got the 200 maybe the rules will change again to achieve better parity. But then again if the Ducati can’t do the distance on one engine then maybe this will be the only win this year. How do you put Eslick back on the lead lap? It took 2 or 3 laps before they decided to mandate a front tire change for the field…. Should they just “forget” about those completed laps? DiSalvo (and Ducati) got lucky. Very lucky. IF the red flag “only” lasted 2 hours instead of 2 1/2, he wouldn’t have made the restart. They wouldn’t have had enough time for the engine change. And Ducati hasn’t done jack in the AMA for years… You probably have to go back to the 90s for Ducati to have been near the front or challenged for wins, so I am not sure the AMA has done to try and favor them. ?? Honestly, I think the DMG/AMA can do whatever they want, so yes, they could have forgotten about those laps. As far as how does DMG/AMA favor ducati-just look at this class-848cc vs 600cc. Also, why was the red flag so long? Conspiracy theorists might think that Ducati was more than just lucky. That said, I enjoyed the racing and i am looking forward to going to Miller this year. yeah, they probably could have. i think in the pandemonium, it probably fell thru the cracks…? and if geico suzuki didn’t think to protest at that moment…? then i could see it getting overlooked. then there’s the question, even if he WAS afforded such an opportunity, would he have even taken it…? sure, he looked fine during the initial interview, but how was he feeling after having sat idle for say 30 mins…? adrenaline’s a mo-fo. 🙂 that was a HUGE get off. good thing the dunlop boffins brought sorted kit or we might not have had any concluding race at all. anybody recall the michelin problem in F1 at indianapolis…? from the furor, you’d a thunk a michelin exec smacked someone’s baby and stole their lollipop…? 🙂 racing is risk. debacles happen. christow does have a point regarding eslick. danny would’ve most certainly not “yardsale’d” off the banking so dramatically if he hadn’t been force fed a shite front tire. 🙁 a front tire that was SOOO bad, dunlop themselves called for a red flag to a wholesale swap the entire grid (when’s the last time that happened?). the comparison further illustrates the cruel mistress that is lady luck. whereas she frowned on danny… yup, she clearly smiled on jason. if not for maybe a 1/2 hr (good point), they both would’ve walked outta daytona co-miserating with zero points. i think the engine failure was a fluke. the EVO is still basically the same engine ‘cept for updated heads (standard ducati tuning fare) that’s been campaining the DSB class for a couple of years now. it’s definitely not a fancy R homologation or anything. while the 848’s do/did have some weaknesses on the bottom end, iirc they’ve racked up no more DNF’s (mechanical) than any other brand….? somebody check my math. What the *#$% is up with the empty stands? Nascar, which is boring to watch, draws in thousands of people. I don’t get it. Are motorcycle fans that selfish that they would rather ride their bikes instead of supporting and promoting motorcycle racing here in america. Maybe americans are too lazy? I hope we get are heads screwed on straight soon. What was the turn out anyways? I think most races have poor attendance…. if you look, there are always lots of empty seats. I don’t get it either. Anyone within 100 miles has no excuse…get out there and support our sport! 2 1/2 hour delay… Anyone who could have fixed their bikes could have gotten back in. Eslick was 2 or 3 laps down at the time, so there was no way he would have been able to get back into the points with only 15 laps to be run. The race continued for 2 or 3 laps AFTER Elick crashed. I am not sure that they could just “forget” about those laps so that he could restart on the lead lap. New surface, very dark and hot… Maybe they should have used the more durable tire from the start just as a precaution. Or maybe for a few years until the new surface has weathered a bit. ?? 2 races at Road America? Austin, TX is getting a new track for an F1 race in 2012. It is being build right now… It wouldn’t surprise me at all to see AMA, WSBK, and maybe even MotoGP look to race there. The only way a Ducati could win the Daytona 200, an engine change, plus shorten the race. It’s not just a displacement advantage it’s a horsepower and large torque advantage. Deja Vu of the year the Buell won it. DiSalvo was able to take a break and then catch up and win. Just wonder if he would have been able to do that on a 600. Think the Daytona 200 is dangerous and should be discontinued. It’s a boring race and is nothing like the rest of the tracks i.e. it’s not a proper race track as Mladin would say. The race-track left plenty of carnage in the young supersport race as well as the other classes. Just a matter of time until a ride will be killed hitting a wall. The Ducati 848 has the 41% displacement advantage and to me should be significant. Indeed the stock 848 makes a tested 115.6 hp (86 kW) at 10,000 rpm and 62 lb·ft (84.1 N·m) at 8,250 rpm. vs the stock Kawasaki ZX=6R 107.7 bhp (80.3 kW) @ 14,100 rpm[ and 42.9 lb·ft (58.2 N·m) @ 12,000 rpm So in percentages bigger displacement Ducati makes 7% more horsepower and a whopping 48% more torque and its delivered at a much lower rpm. So folks is this a fair fight? I say no. 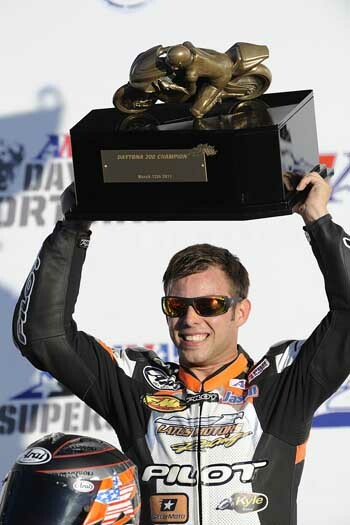 When did Buell win the Daytona 200? 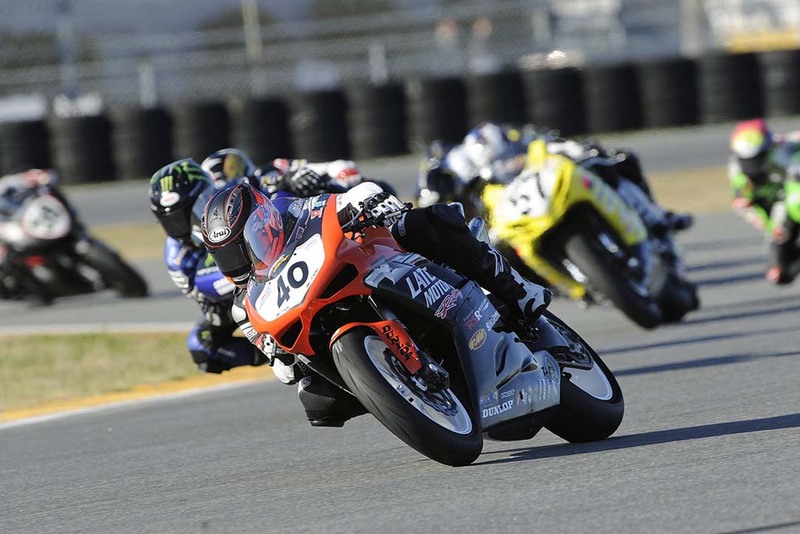 Buell has never won the Daytona 200. Ever. The AMA is sooo bad that I stopped DVRing any AMA racing 3 years ago. I would rather watch some sappy chick flick before this crap. I will take an ambien and wait for next weekend….first GP of the year! Wooo hooo! It’s sad to see what has become of The Daytona 200 over the last decade. That’s all I have to say.